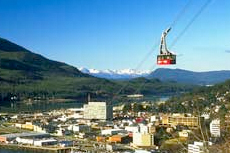 Ride the tram up Mount Roberts and experience the panorama of Juneau and the Inside Passage from 1,800 feet above the city. Our tour guide Abby was excellent and very informative. My granddaughter ended up being the only one to do this and she loved it. Great views. Too many jewelry stores in Juneau, not enough other shopping opportunities. This is a must do. The mountain offers great views of the harbor. Incredible views and very interesting history provided by the tribal hosts. Nice view. Film at center at the top was informative. Not crowded early in the day. Can return anytime same day, but lines got way too long. Great views but trails were pretty antiquated and made it difficult to maintain balance! It was $5 less if I would have booked it on my own. It was $5 less if I would have booked it on my own. So worth going on this. It was cloudy, but I still enjoyed it immensely. There are trails up on top and I am glad I went on one. It was very nice! I would recommend this. We did this at the end of the day, so the "all day pass" does seem quite as worth it, but it is still a must do in Juneau. Riding up to Mount Roberts on a clear day gives you a fantastic view of the surroundings. Cloudy and rainy day but what could be seen was beautiful. Cloudy and rainy day but what could be seen was beautiful. Tram is very fast. Stunning views of the fjord from the top of the Mt Roberts tramway - Small museum and plenty of walking trail. Otherwise the town was a disappointment and rammed full of jewellery shops all competing for business. The view from above was spectacular. The view from above was spectacular. Ride up and back offered great views. There is a gift shop (of course!) and some wildlife if you get there before dusk. This ticket could be purchased just as easily at the Mount Roberts Tramway office. The views from the top of the mountain were great, but the lines to get up and then down, were very long. Great ride up the tram, informative movie about the area&apos;s history. Great ride up the tram, informative movie about the area&apos;s history. However, there wasn&apos;t a lot to do at top. The tram gave us a spectacular view of the city. This was a nice way to visit the top of the mountain. Beautiful views. Gift shop at the top. Nice place to hike around at the top.